I shook my head like there was sand in it and we all searched: she directing, I flapping and he savaging snowdrifts like a squirrel. “Oh I thought you’d lost your camera …!” - and suddenly it all became clear. The Mournes with Kernowclimber and Mcrtchly is a revelation. When I tackle a hill, I carry what I am wearing. When Kernie and Critchie kick off, they take everything they own. Snowshoes, crampons, ice axes, a collapsible kitchen, enough healthybars to revive Piltdown Man and a spacious 6 man tent. Probably. And thus equipped, we set off for a spectacular day in snowbound Mother Mournes to bag Beag and Cove, the last in their first 100. 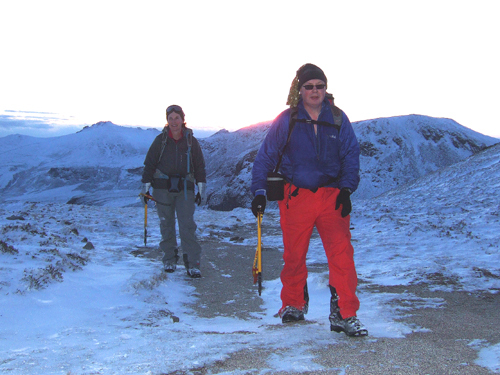 “Measured” describes their hillwalking style: stop and look, stop and chat, stop and eat, stop and marvel. Because they know that whatever may come, they are kitted out for every eventuality. When they dandered off the Glen River in near complete darkness, I was lepping down through the woods for my life. Back at base, I half expected them to phone and say they would just stay up the hill ‘til Thursday. The date of our deaths will come soon enough. Some of us will run at it. Some will saunter. Suddenly I know who I am with. Peter Walker 4 hours ago.